While Power BI is a self-service BI tool that is easy to use, a Microsoft partner like us can help in setting up your Power BI account optimally and to prepare the datasets that integrate and work seamlessly with Power BI. Our Power BI consultants are skilled at using Power Query & DAX languages to query data sources, clean, load & analyze the data and building reports with rich data visualizations to boost productivity. After thorough examination of your data infrastructure our Power BI consultants will devise a roadmap to address your organization’s problem correlated to unexploited data and help you achieve your business goals through informed decision making. Congruent can directly integrate massive volume of data from internal and disparate external sources with Power BI to analyze and interpret. In cases where the data is not in a desired format for Power BI, we will quickly query and load the data into a file before uploading it into Power BI. Congruent can make sure you receive an uninterrupted flow of data into your power BI. Our Power Bi consultants can quickly clean, prepare and enrich data from multiple sources in order to be used by Power BI. We use DAX (Digital Analysis Expressions) to create measures and calculated columns for smaller datasets. For larger datasets (DirectQuery), calculated columns and measures are required to be built in data source. Our customized dashboards and reports are role-centric for every user in you organization, bringing right information to the right person at right the time which is easy to adopt or understand and help users to make smart/informed decisions. 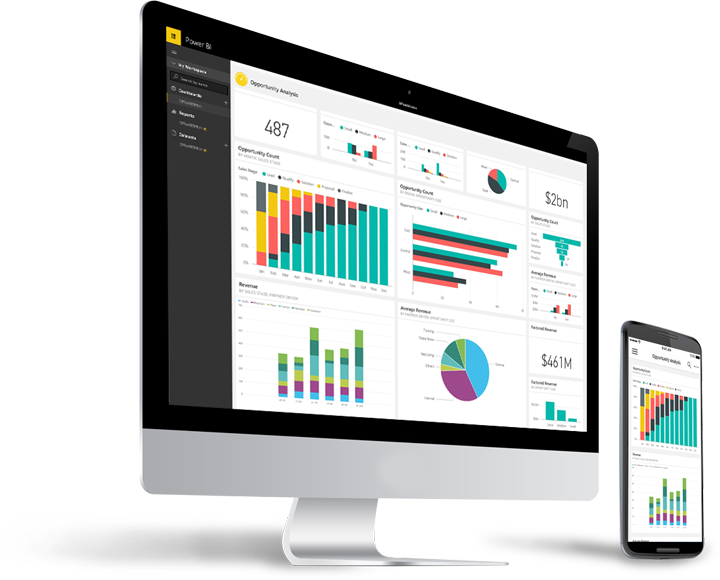 Our power BI consultants provide training session to make sure you get a better handle over your dashboard. Post-implementation support conducted to check regularly and making sure that your organization is using Power BI to its full potential. Take a look at how our power BI consultants helped a multinational bakery product manufacturer gain deeper insights into their sales performance and predict sales figures & inventory demand for subsequent months. Customer had unstructured data of 90 million sales transactions in excel sheets from their different agencies spread throughout the country. After complex process of data extraction and preparation, the data source was integrated to Power BI, thereby identifying their KPIs and creating visually eye-catching reports on sales figures, quantity and returns against each geography, agency, channel, time period etc. Enabling your employees and decision makers and analyze data faster with better efficiency and understanding using cloud based analytics service. Power BI provides users with a wide range of insights through simplified but effective dashboards, accurate reports and engaging visualizations, thus becoming a seamless tool to bring data to life. Power BI connects to any data source and brings compelling business insights at a very low cost, delivering real time analytics using effective dashboard on various devices like desktop, mobile, tablets etc. Microsoft Power BI is designed in a way that it does not require end users to have programing skills to explore, analyze and process the data to make better informed business decisions.